Want to wear the feather? Now you can - for a good cause! Welcome to ASF Swag - a place you can show your geeky wit and support for The Apache Software Foundation (ASF) at the same time. A portion of all profits from sales of feathered items are donated to the ASF. Always a handy shirt to have if you're known as a geek. Which one do I push to HUP? 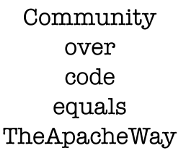 All items are licensed by the Public Relations Committee of The Apache Software Foundation. The feather and other indicia are trademarks of the ASF. If you are a committer attending ApacheCon US 2008 and are interested in a shirt, email me privately. If there is sufficient interest, I'll make a bulk order at cost for folks. If there's enough people who ask, I'll also offer shirts from other vendors besides CafePress, too! Let me know what you think. Replies in code accepted.